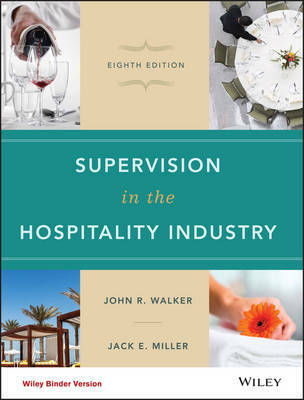 Author(s) Walker, John R.; Walker, John R.; Miller, Jack E.; Miller, Jack E.
Supervision in the Hospitality Industry: Leading Human Resources, 8th Edition Binder Ready Version focuses on the different roles of employees from beginning leaders, newly promoted supervisor, or anyone planning a career in the hospitality field. A market leader, this text is widely used by thousands of students training for a career in the hospitality industry and current hospitality supervisors alike. Supervision is unique in that it does not solely rely on the supervisor’s point of view; instead, it considers the viewpoints of all levels of associates to create an informed picture of management and supervision in the hospitality industry. This text is an unbound, binder-ready version.